Michelle Davies | The Journal Gazette Jason Hatfield with O'Neil's Glass cleans off the sidewalk Thursday after a jewelry store heist. 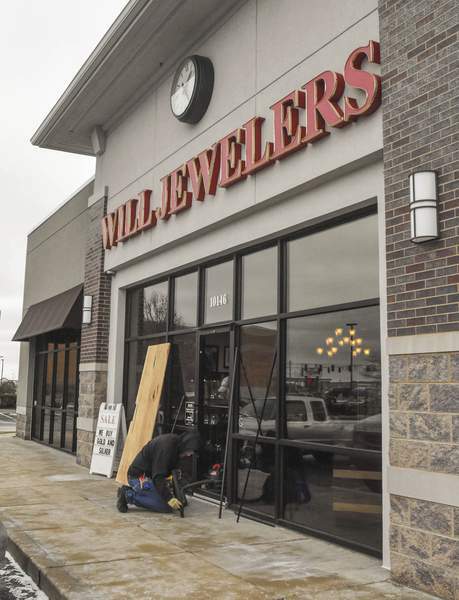 Dan Will, co-owner of Will's Jewelry on Maysville Road, figures the jewelry thieves were in a big hurry and couldn't see too well. Otherwise, they might have noticed the watches they grabbed after smashing the display case glass were the store's signature brand. Those watches run between $200 and $300 apiece, Will said. The watches in the next case – Swiss Army and similar brands – cost twice as much. “It was too dark for them to even see what brand they were,” Will said of the burglary that occurred around 5 a.m. Thursday. Between the time the alarm went off and when police arrived, the two thieves scooped up watches, about 18 sample wedding rings worth next to nothing, some men's chain necklaces and costume jewelry, Will said. “They really didn't get that much,” said Will, who owns the store with his siblings. “Ninety-five percent of the store is packed up and stored at night.” Precious gems spend the night in the safe, he added. Camera surveillance indicates two men smashed the front door, grabbed their loot and left quickly, jumping into a white van. The van was reported stolen off State Boulevard and was found on Ricker Road in northeast Allen County, Will reported. Camera surveillance didn't reveal the license plate, but police apparently knew the van, Will said. By 2 p.m. Thursday, the glass had already been replaced on the front door and the showcases were about to be replaced. “Everything will look the same tomorrow,” Will said, meaning today. The family owns the store at 10146 Maysville Road and one on Illinois Road, Will said. The same procedures are followed there. “If I left everything out in showcases, it wouldn't last a night,” Will said.